China is building two new classes of missile submarines in addition to the eight nuclear missile submarines and six attack submarines being deployed as part of an arms buildup that analysts say appears to put Beijing on a war footing. "In terms of China's submarines, they're investing heavily in a robust program for undersea warfare, developing submarines that are both conventional, diesel-electric powered, air- independent propulsion and nuclear-powered attack submarines," David Helvey, deputy assistant defense secretary for East Asia, told reporters at a briefing on release of the Pentagon's annual assessment of Chinese military power. China has yet to conduct an underwater test firing of its submarine-launched missiles but is deploying new missile submarines and planning advanced versions. "We see China investing considerably in capabilities for operations in this area," he said. The Pentagon’s latest annual report to Congress also includes new details of China’s deployment of an aircraft carrier-killing ballistic missile, two new stealth jet fighters, and a new road-mobile intercontinental ballistic missile in addition to three other new ICBMs. The Chinese military is also developing cyber warfare capabilities that can be used in preemptive attacks, the 92-page report states. Chinese missile forces, known as the Second Artillery Corps, are "developing and testing several new classes and variants of offensive missiles, forming additional missile units, upgrading older missile systems, and developing methods to counter ballistic missile defenses," the report said. Of particular concern to the Pentagon is the deployment near Taiwan of a precision-guided DF-21D anti-ship ballistic missile, according to the report. "We're concerned about the ability of China to develop missiles that can project its military power with precision at great distances from China—obviously something that can hold at risk large surface ships, including aircraft carriers, is something that we pay attention to, but we put it in the context of a number of China's military developments, again, that we characterize as anti-access and area denial," Helvey said. However, Helvey noted that no single weapons system is the problem. Instead, he said, "it's the integration and overlapping nature of these weapons system into a regime that can potentially impede or restrict free military operations in the Western Pacific." "So that's something that we monitor and are concerned about." "The DF-21D is based on a variant of the DF-21 medium-range ballistic missile and gives the PLA the capability to attack large ships, including aircraft carriers, in the western Pacific Ocean," the report said, noting that its range is greater than 932 miles and that it is armed with a high-technology maneuvering warhead. Additionally, the report confirms, China is building a new road-mobile ICBM that is likely capable of being armed with a multiple independently targetable re-entry vehicle (MIRV). The Free Beacon first reported Aug. 15 that the new missile, described by defense officials as the DF-41, was flight-tested and is expected to be equipped with MIRVs. "The Second Artillery continues to modernize its nuclear forces by enhancing its silo-based intercontinental ballistic missiles (ICBMs) and adding more survivable mobile delivery systems," the report said. New road mobile missiles deployed in recent years include DF-31 and DF-31A mobile ICBMs and the JL-2 submarine-launched ballistic missile. The DF-31A has a range of about 7,000 miles. "This administration is reluctant to just come out and say it, but this report makes clear that China is preparing for small-scale and then large-scale wars against the United States and its friends and allies," said Richard Fisher, a China miltiary analyst with the International Assessment and Strategy Center. "It is time to start signalling to China's leadership the broader economic, political, as well as military costs of its current course before it believes it can confidently embark on surprise military campaigns." Beijing is also rapidly building new radar-evading stealth fighter-bombers known as the J-20 and J-31. "Within two years of the January 2011 flight test of China's first stealth fighter, which we call the J-20, China tested a second prototype, which is referred to as the J-31," Helvey said. "The first J-31 flight test, in October 2012, highlights China's continued ambition to produce advanced fifth-generation fighter aircraft." Helvey said the Pentagon does not expect either the J-20 or the J-31 "to achieve an effective operational capability before 2018." U.S. intelligence assessments from five years ago said China would not field a jet comparable to the U.S. Air Force F-22 stealth fighter before 2018. As a result, the Pentagon canceled production of the F-22 at 187 jets. The first test flight of the J-20 took place two years ago and surprised the U.S. military. It was tested during the visit of then-Defense Secretary Robert Gates, who was criticized for canceling F-22 production. China’s surface naval forces are also expanding rapidly with deployment of several new types of warships, including the first aircraft carrier, the Liaoning. Helvey said the carrier conducted its first aircraft launch and recovery operations in November with J-15 fighters. "We anticipate that China will spend the next three to four years on training and integration before achieving an operationally effective aircraft carrier capability," he said. "China will likely build several indigenous aircraft carriers over the next 15 years." Chinese cyber and space weapons capabilities continued to be developed. Helvey said those warfare capabilities are being closely watched. For the first time, the report linked large-scale cyber attacks and intrusions of computer networks to the Chinese government and military. "In addition, in 2012, numerous computer systems around the world, including those owned by the United States government, continued to be targeted for intrusions, some of which appear to be attributable directly to [People’s Republic of China] government and military organizations," Helvey said. Asked about Chinese economic espionage, Helvey declined to provide details but said, "We're always mindful of the potential threats to the security of our defense technology and defense systems." The report also discusses China’s assertions of territorial and maritime claims that are upsetting stability in the region. "In this report, we do highlight China's increased assertiveness with respect to its maritime territorial claim," Helvey said. China is claiming most of the South China Sea as its territory and is disputing Japan’s claims to the Senkaku Islands. Both areas are said to have large deposits of undersea gas and oil to which energy-hungry states in the region seek access. China’s government routinely protests the annual report, claiming it is part of a Pentagon campaign to hype the threat from China. Helvey said the Chinese are aware of the report and were not consulted prior to its release on Monday. 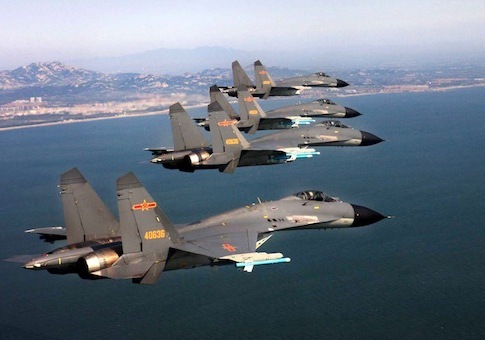 "China's leaders continue to see the modernization of its military as a central component of their strategy to advance China's national development goals in the first two decades of the 21st century," he said. Fisher, the IASC military analyst, said the latest report is far more useful than the truncated 43-page report from 2012. "The first ever report disclosure of development of the Type 096 SSBN raises the prospect of a new submarine launched missile that also may be multiple warhead capable," Fisher said. "As the Administration presses for additional reductions in U.S. nuclear warhead levels and shows reluctance to fund U.S. nuclear arsenal modernization, it is doubly important that Congress be informed about the size and growth of China's nuclear forces." Fisher said the report failed to address China’s transfer of strategic missile technology to North Korea, specifically the transporter-erector launchers for Pyongyang’s new KN-08 road-mobile intercontinental ballistic missile disclosed for the first time during a military parade in April 2012. "A failure to chastise and sanction China's action will only serve to undermine confidence in American security guarantees and increase interest by our allies in their own nuclear deterrents," he said. Former State Department intelligence official John Tkacik said the report’s most important revelations are on the Chinese navy and especially its submarine forces. "Last year's report disclosed that two Jin-class ballistic missile submarines were already operational, and now the 2013 report counts three, so I take the DIA bean-counters' word for it, China is launching one new boomer each year," Tkacik said. Each of the missile submarines will be equipped with 12 JL-2 missile that likely will have multiple warheads. The new submarines mean the Chinese are adding at least 180 new nuclear warheads to their arsenal, a sharp increase from the U.S. intelligence estimate of 240 warheads, Tkacik said. In addition to the new missile submarine planned as a following on to the Jin submarines, China is planning at least one more advanced Typ 096 missile submarine a year indefiniately, Tkacik added. "The real news is the construction of a new special-purpose class of guided-missile submarine, the Type-095 SSGN," he said. "A Chinese SSGN [cruise missile-firing submarine] is not only a new threat for the U.S. Navy to worry about, but it will deeply unsettle China's neighbors in East and Southeast Asia."